John McClane, the thorn in the side of those terrorists, the man who screws up the plan, and the only person who can save the hostages in Nakatomi Plaza is returning to theaters to celebrate the film’s 30th anniversary! Often cited as “One of the greatest action movies ever made” and “Best Christmas-themed movie (if you consider it a Christmas Movie)” made its debut in the summer of 1988 and starred a relevantly known comedic actor Bruce Willis (best known at the time for Moonlighting). 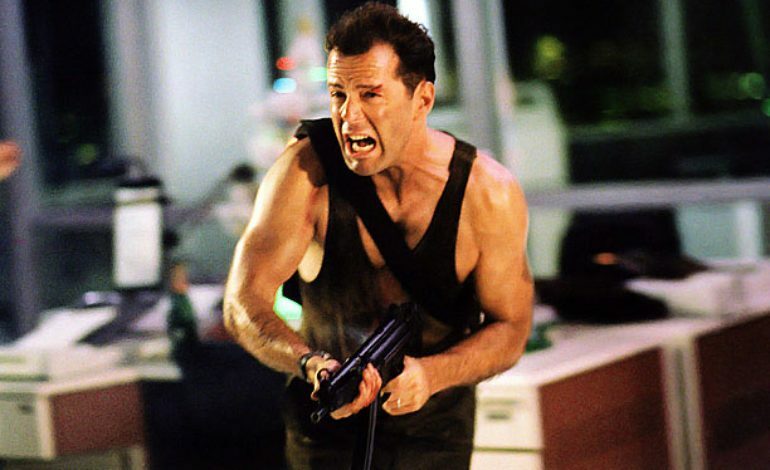 Receiving positive reception from critics and being a Box Office success led to the film spawning four sequels, numerous video games and becoming the standard formula for action movies over the next decade, Die Hard is the essential action film. Fathom Events along with Turner Classic Movies are bringing the iconic film back to the big screen for all audiences to enjoy once again. Tickets are already on sale so don’t miss your chance to witness McClane and Hans Gruber (played by Alan Rickman) battle it out in Los Angeles. Featuring a great supporting cast which includes Bonnie Bedelia (McClane’s estranged wife) Reginald VelJohnson (as Sgt. Al Powell) and William Atherton (as Richard Thornburg, that arrogant reporter covering the story), it was directed by John McTiernan (Predator) and written by Steven E. de Souza and Jeb Stuart based off the novel titled Nothing Last Forever. Tickets are available here so don’t miss your chance to see Die Hard on the silver screen!